James Arthur Ray is led back to his cell after his initial appearance on manslaughter charges in Yavapai County Court in Camp Verde, AZ, Thursday. “f8 and be there” is an old saying in photojournalism. It basically means showing up is the most important part of an assignment. I’ve never really liked it because I think it demeans the profession. In this case, though, it’s certainly appropriate because getting “there,” theYavapai County court in Camp Verde, was the hardest part of the assignment. I was first sent to Prescott, the Yavapai county seat, because the reporters on the city desk gave the wrong information to the photo desk. In Prescott, I discovered the assignment was actually in Camp Verde, so I raced over the back roads of Yavapai county to get to the assignment on time. The assignment itself was not that complicated. 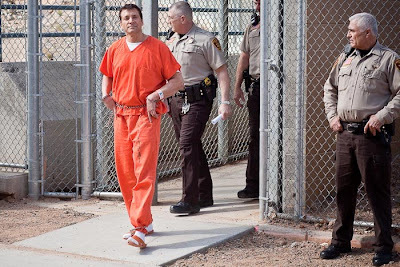 James Arthur Ray, the controversial self help guru, had been arrested in Prescott on Wednesday, Feb 3 on manslaughter charges related to the deaths of three people at a sweat lodge ceremony Ray held in Sedona, AZ, in October 2009. My assignment was to photograph him at his initial appearance. The case has captured the attention of the national media because it involves the wealthy (Ray charged participants more than $8,000 for the weekend), the gruesome nature of the deaths (in a dark, steam enveloped crowded tent with people throwing up and passing out) and “borrowed” Native American traditions. Holding the event in Sedona, home to power vortices and mystical crystals was just icing on the cake. Initial appearances are not usually a big deal. But this one was, so I ended up in Camp Verde photographing the self help guru through a hole in a chain link fence. Once I got to Camp Verde it really was f8 and be there. There are more photos from Ray’s initial appearance in my PhotoShelter archive.